Caramel. Pecans. Chocolate. Cheesecake. Brownies. What else could you need? This is the most delicious and decadent dessert I’ve made in a while. I will admit, I love cheesecake. I love brownies. When you add all this ooey-gooey deliciousness to the top, I pretty much fall in love. I know, I know, you just made your New Year’s resolution to be healthier, right? Well, I have a secret for you….these are made with 1/3rd less fat cream cheese!! Ta-da!!! Healthy!!! Am I convincing you yet? Do you need convincing? Probably not. Just make them and eat them…or make them and give them away – you will have 20 new best friends! These are really easy to make, and although they take some cooling/fridge time, they are SO worth it. Make these the day before a party or event, and then add the toppings the next day. Perfect. Don’t like pecans? Substitute your favorite nuts, anything would be delicious. 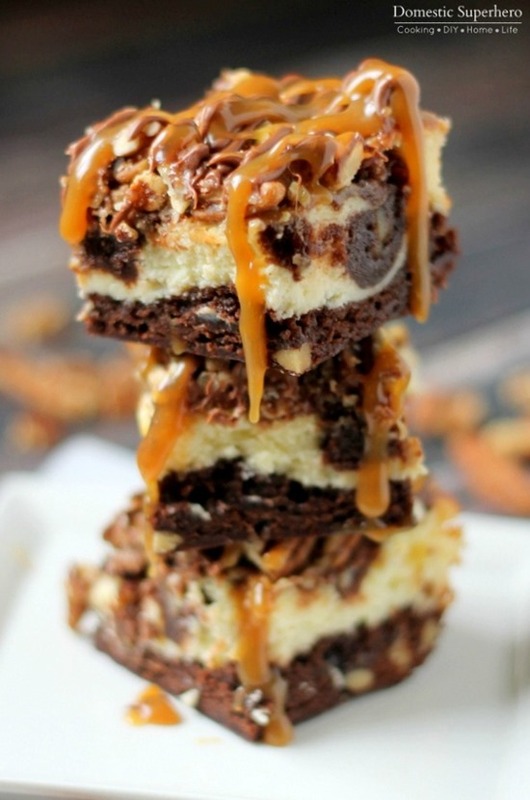 Amazingly delicious brownie recipe filled with caramel, chocolate, nuts and cheesecake! In a stand mixer or with a hand mixer combine melted butter with sugar and vanilla. Add eggs one at a time, beating well after each one. Add the cocoa and mix well. Then add the flour, baking powder and salt, walnuts, and mix until just combined, do not over mix. Set aside one cup of the brownie batter and smooth the rest into a foil lined 7×11 baking dish. For the next layer: With your stand mixer or hand mixer (cleaned off), begin making your cheesecake layer by beating cream cheese and sugar until smooth. Pour the cream cheese mixture on top of the brownie mixture. Using a spatula, smooth it evenly over the brownie batter. Drizzle ¼ cup of caramel sauce over the top of the cream cheese layer. Then, using the reserved cup of brownie batter, drop spoonfuls over the top of the cheesecake/caramel. Use your spatula or a butter knife to gently swirl the batters. This will combine the cream cheese layer and top brownies layer a bit. This does not need to be perfect. Bake at 350 for 45-55 minutes. Start checking at 45 minutes and look for the cheesecake to be just set. Allow to cool for 10 minutes, then using the sides of the foil, pull the brownies up and out of the dish. Set on a wire rack and allow to cool for at least 1 hour, and then place into the fridge for at least 2 hours. 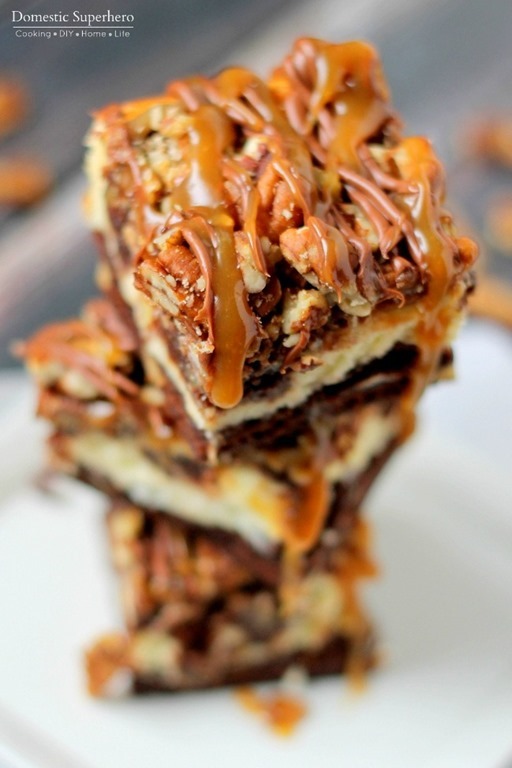 Remove from fridge, and drizzle 2 TBS caramel sauce over the top of the brownies. Then sprinkle the chopped pecans over the caramel, covering the top. Place chocolate chips in a small microwave safe bowl and microwave for 30 seconds. Remove and stir with a spoon or fork, then continue to microwave in 15 second increments, stirring every 15 seconds, until the chocolate is melted. This shouldn't take more than 90 seconds at the most (probably more like 60 seconds). Drizzle melted chocolate over the top of the nuts. Drizzle remaining caramel sauce over the nuts as well. I can’t wait to see y’all in February! I will have another mouth watering recipe to share with you! Want more in the meantime? Feel free to visit my blog, Domestic Superhero, or connect with me on social media! I love sharing recipes on Facebook and Instagram! I am in love! 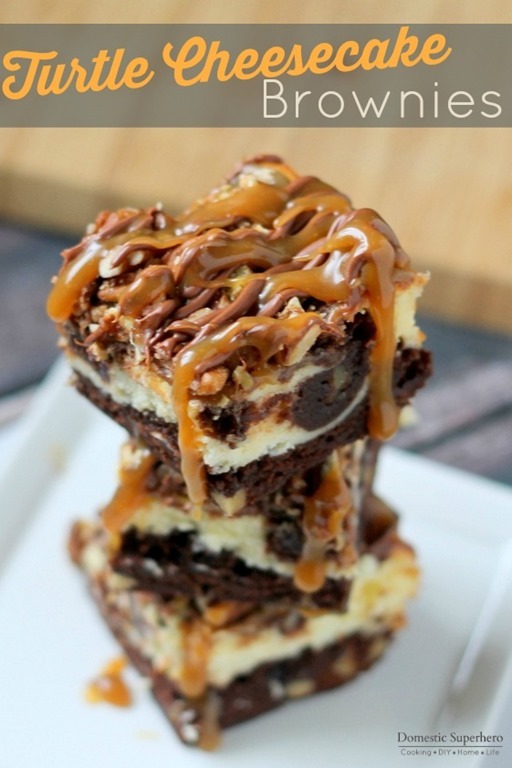 You are totally right… what is there not to love about cheesecake, brownies, and caramel!! Yum! !